Four US tournaments and one in Canada mean plenty of Americans on the Pro Circuit this week, with many juniors who competed in the US Open in New York last week also finding success on the professional circuit. At the $25,000 women's event in Lubbock, Texas the only American remaining in singles is qualifier Ashley Kratzer, while four British girls are into the final eight. Kratzer, a 17-year-old from California, beat USC sophomore Jessica Failla 6-4, 6-1 and will play Great Britain's Katie Boulter in Friday's quarterfinals. No. 2 seed in the tournament is US Open finalist Viktoria Kuzmova of Slovakia, who advanced to the quarterfinals with a 3-6, 7-5, 6-4 win over Wesleyan's Division III champion Eudice Chong of Hong Kong. Kuzmova had beaten 2015 Wimbledon girls champion Sofya Zhuk of Russia 6-1, 6-2 in the first round. Katie Swan of Great Britain is also into the quarterfinals, having eliminated top seed Ana Vrljic of Croatia in the first round. The $50,000 women's event in Atlanta has two American quarterfinalists, neither of them seeded: Melanie Oudin and Kristie Ahn. Oudin will face another player coming back from injury, Great Britain's Laura Robson, while Ahn meets No. 3 seed Michaela Krajicek of the Netherlands. Tessah Andrianjafitrimo of France, a quarterfinalist at the US Open Juniors last week, has also advanced to the final eight. She will play Elizaveta Ianchuk of Ukraine, who upset No. 2 seed Taylor Townsend in today's second round. Canada is hosting a $25,000 men's Futures event this week, with the semifinals set for Friday. Rhyne Williams, the No. 7 seed, beat top seed Kaichi Uchida of Japan 6-2, 6-2 in today's quarterfinals and will play wild card Benjamin Sigouin of Canada. The 17-year-old Sigouin, who lost in the first round of singles at the US Open junior championships last week and reached the doubles final, defeated No. 3 seed Takanyi Garanganga of Zimbabwe 2-6, 7-5, 6-3 in today's quarterfinal. Former Columbia star Winston Lin, the No. 8 seed, will play 2012 US Open boys champion Filip Peliwo of Canada, who is the No. 2 seed in this week's tournament. Sigouin and Williams have reached the double final, although not as partners. Sigouin is playing with Juan Carlos Aguilar of Bolivia, who won the US boys doubles title last week, playing against Sigouin, while Williams is partnering former Abilene Christian star Hans Hach of Mexico this week, and they are seeded No. 2. Also of note from the Canada Futures, 18-year-old qualifier Mwendwa Mbithi picked up his first ATP point with a first round win Tuesday. At the $10,000 men's Futures in Claremont, California, wild card Martin Redlicki and qualifier Evan Zhu, both UCLA Bruins, have advanced to the quarterfinals, as has Alexios Halebian, the No. 5 seed. Redlicki, a junior who won the NCAA doubles title back in May, beat top seed Jan Choinski of Germany in the opening round and Ty Trombetta in today's second round match. The 18-year-old Zhu, a freshman at UCLA, reached his first Futures quarterfinal by beating No. 2 seed and former UCLA All-American Clay Thompson 6-4, 6-4. 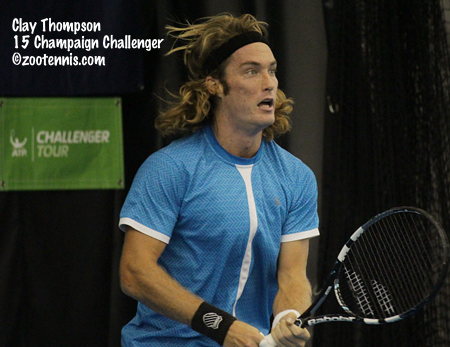 After the match, the 24-year-old Thompson, who brought entertainment value to any tennis match he played, announced he was retiring from pro tennis. Thompson won one ITF singles title, last year in Mexico, and reached a career-high of 408 in the ATP rankings earlier this year. At the $50,000+H Cary, North Carolina ATP Challenger, the bottom half of the draw is all-American. No. 2 seed Frances Tiafoe will play unseeded Tennys Sandgren in the quarterfinals, while Ernesto Escobedo, the No. 8 seed, will face No. 4 seed Stefan Kozlov. In the top half, No. 1 seed and defending champion Dennis Novikov plays No. 5 seed Peter Polansky of Canada and wild card Brayden Schnur of Canada faces James McGee of Ireland. The 21-year-old Schnur, who turned pro after his junior year at North Carolina, won a $25,000 Futures title earlier this month and reached the quarterfinals of a Challenger for the first time with a 7-6(1), 6-1 win over Eric Quigley tonight. CiCi Bellis has reached her first WTA tournament quarterfinal as a pro (she was still an amateur earlier this summer when she made the quarterfinals at the Bank of the West WTA event at Stanford) this week in Quebec City, and she will face Julia Boserup for her first WTA semifinal. With top seed Genie Bouchard's loss tonight, none of the quarterfinalists are seeded, with Lauren Davis, at 104, the highest ranked player remaining in contention for the WTA International level title.